The “young’uns” that breasted up against us last night were still examining the insides of their eyelids as we slipped away this morning. Jan retied their boat to the bollards and then re-joined Waiouru. 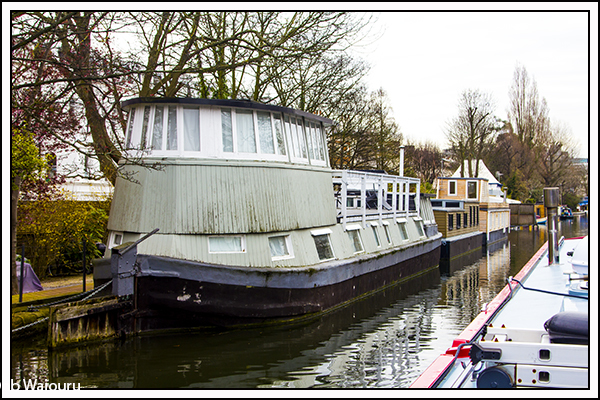 Our mooring at Rembrandt Gardens wasn’t going to be available until noon which meant we weren’t in a hurry. Most of the cruising was done at tick-over. Jan even managed to do a load of laundry whilst we were moving. There was an unplanned stop outside the Sainsburys at the eastern end of Kensal Green Cemetery when one of those large and thick plastic bags tried to devour our propeller. At one point it appeared the bread knife might be required as part of the removal effort, but eventually it was untangled and we moved off. But not before Jan disposed of it in the nearby bin. It’s rather ironic that we should get a fouled prop when the this part of the canal is looking considerably cleaner than the western end. 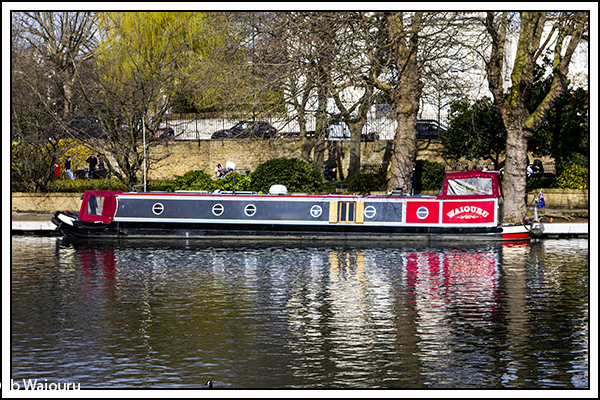 The canal from the cemetery onwards has numerous moored boats which then double up as you get closer to Little Venice. We also noticed a number of the boats are not displaying a licence, name or boat number. That must make owner identification difficult! Both of us were interested in the line of terraced homes in the photo below. They are very narrow being squeezed between the road and canal. The second storey appears to have a rear balcony and we assumed the ground floor was one dwelling with the 2nd and 3rd floors being a second dwelling. 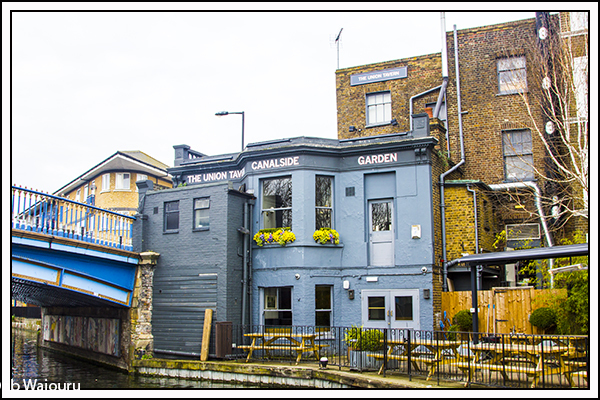 The Union Tavern Pub almost passed unnoticed being tucked behind the adjacent bridge. A single boat mooring for patrons. I wonder how often it is used? The canal isn’t completely empty of litter. 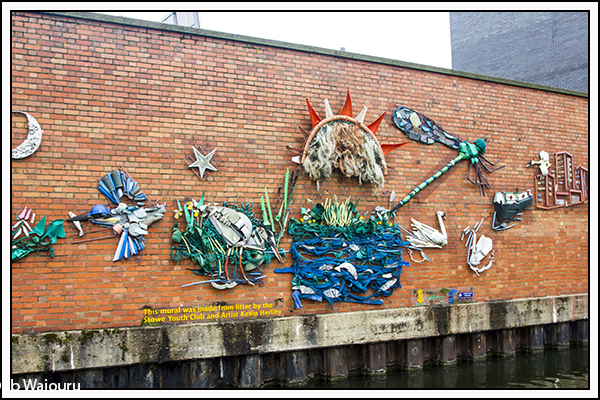 The following mural was made from recovered litter. 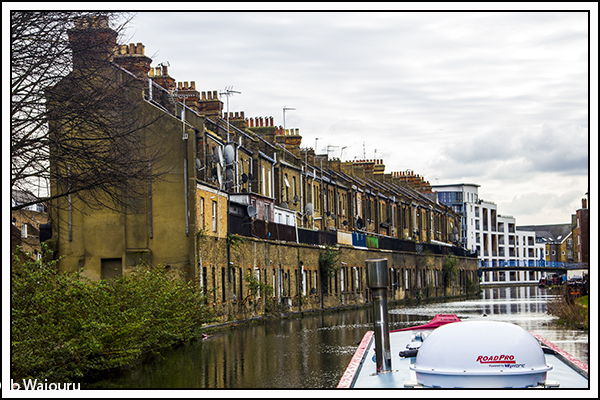 There are a number of houseboats and a rather large boat on the offside as you head down the final straight towards Little Venice. The superstructure must have been added after it reached the mooring as it wouldn’t have fitted under some of the bridges. 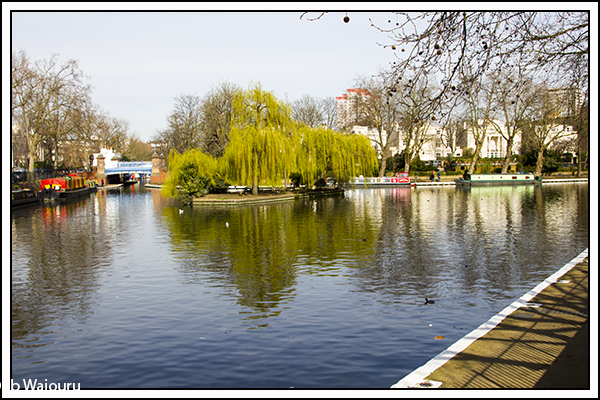 The CRT facilities block is located at the end of the straight immediately before entering Little Venice. We stopped to top up the water tank and whilst it was filling I wandered into the adjacent CRT office to enquire about the location of the Rembrandt Gardens moorings. My guess on their location was correct. Meanwhile Jan had been approached by a young lady asking if she could borrow our BW key to gain access to the elsan. Not wanting to give away our key we opened the door for her. Then we heard the tale from a boater that he had sunk his boat twice in the junction by opening his weed hatch and flooding the engine bay. I think I would have been far too embarrassed to publically admit to a repeat mistake of such magnitude. Our mooring is very nice and reasonably secure. The gardens are locked at dusk, although there is a an open gate under the adjacent bridge. We are on one of two available moorings. These can be booked for a week but only twice per annum. We are here for the next six days. I have been led to believe that the as the boat was once Richard Branson's London pad. Can't check the story. . .
We passed you a couple of hours ago on the way to the basin. To our amazement there was space! Do call if you walk this way and we are in. Our apologies for not replying to your comments. For some reason your comment didn't send the notification email and it wasn't until I happened to check the blogger template that I noticed your two unpublished comments. We're sorry we missed catching up with you in Paddington Basin. Perhaps another time?